The Old Students’ Association of the Bishops’ High School (BHSOSA) yesterday launched the third in a series of directories on the school. At the Oswald Parry Hall, the committee members of the BHSOSA gave an overview of the features of the directory, while stating that the directories include brief histories of the school and the Association, including information on head teachers, head prefects, chapters and international reunions. Each directory includes a description of one of the special collaborative initiatives of the school and the BHSOSA, such as their CARICOM Programme and the Lower Sixth Programme. Special features, including profiles of former students who have served locally and internationally, are also included in the directories .These profiles provide insight into the range of occupations which have been pursued by alumni, possible educational pursuits and the voluntary activities which have been carried out. Speaking at the ceremony, Cathy Hughes stated that the directory is a valuable networking tool for alumni and the wider public as well as a motivational one for the current students and young people who are contemplating the beginning of their career. “The publication of the directory is more like historical information. I believe this directory is a powerhouse of information of the skills any employer can take advantage of,” she said. The sponsors of the project were given directories during the launch. These included Citizens Bank Guyana Inc, Digicel Guyana, and Frandec Travel Service. 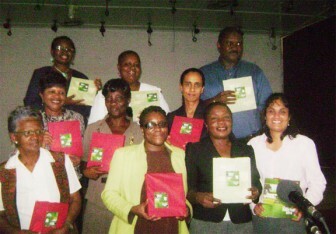 Directories were also presented to the University of Guyana Library.